Directions: From Puduraya, drive towards Bank Negara via Masjid Jamek. Turn left at the junction where Jalan Tun Perak connects with Jalan Tuanku Abdul Rahman / Jalan Raja. 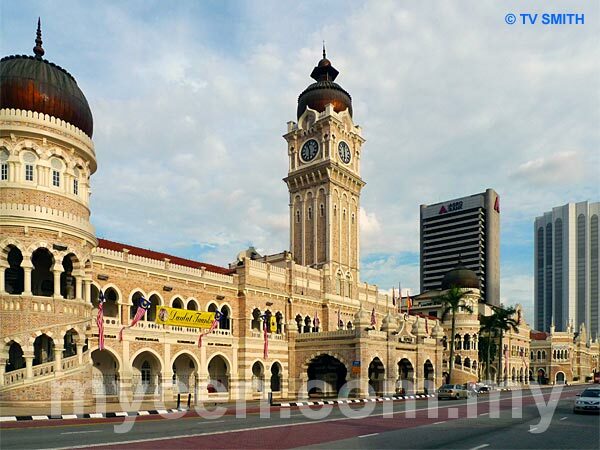 Info / Insights: Designed by British architect A.C. Norman, the Sultan Abdul Samad Building was built in 1896. The historic building has Moorish and colonial elements written all over its exterior. Like other stately heritage buildings in Malaysia, she sometimes has to suffer the indignity of being dressed up with garish lights or to be tacked with some lame propaganda slogans. The eponymous Sultan Sir Abdul Samad ibni Almarhum Raja Abdullah (1804 - 1898) was the fourth Sultan of Selangor. Kuala Lumpur was part of Selangor until 1974, if you remember. The building is also popularly known as The Clock Tower. Before the birth of Petronas Twin Towers, the Sultan Abdul Samad Building was often seen on postcards and used as a graphical symbol to represent the city of Kuala Lumpur. The Grand Old Dame witnessed the lowering of the Union Jack and hoisting of the national flag for the first time in 1957, when Malaya acheived independence. The (recently coined) Dataran Merdeka or Independence Square was to become the venue of many Merdeka anniversary parades and celebrations. The Padang, as it was then known, is surrounded by two other famous centenarians, namely; The Royal Selangor Club (aka The Spotted Dog, built 1884) and the St Mary's Cathedral (built 1894). Another nearby historical landmark is the fire-prone Panggung Bandaraya (built 1896). The grass on the former Selangor Padang was dug out in 1988 and a flood-prone car park and mall (Plaza Putra) was constructed underneath. When the nation was going through some kind of longish object-envy phase in the 80s, a giant flag mast was erected at the square just to create yet another (meaningless) record. The Sultan Abdul Samad Building is also fondly remembered as a judicial institution. It housed the apex court or the Supreme Court before it moved to the Palace of Justice in Putrajaya. It is currently occupied by the Ministry of Information, Communication & Culture. The iconic clock tower was also used in the ceremony to mark the standardisation of Peninsular and East Malaysian time in 1982. From RMAF jet fly-bys to Mat Rempit motor race-bys, the stoic and proud lady has seen it all.